Knowing what to wear during your karting sessions can be tricky. A lot of the time it will depend on whether you are karting purely for fun, or whether you are much more serious about your karting. This also determines how likely you are to be caught out by an unexpected change in the weather. 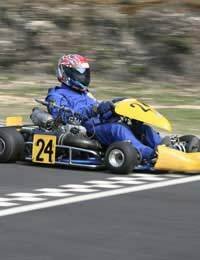 If you’re just getting started in karting, or if you only plan to go karting a few times a year, you won’t need to splash out on lots of expensive karting gear. A protective helmet that covers all of your face, or as much of your face as possible. Protective overalls. These are usually fireproof, but some people choose to have waterproof ones as well. Protective gloves and sensible footwear. Most of the time, these will be provided as part of the cost of the karting package. The only thing that you will need to bring is the sensible footwear. Trainers are usually the best option, but many experts frown upon the idea of wearing trainers with a thick sole. Wearing trainers with thick soles can mean that you can’t feel how much pressure you are putting on the pedals. This can be potentially quite dangerous, as you often only need to apply minimal pressure to the pedals in order to brake or accelerate, and applying too much pressure can result in your steering and handling being a lot different from what you anticipated. It’s not uncommon for new karters to either brake far too suddenly or accelerate far more quickly than they should because of this problem. To avoid a situation like this, it is recommended that you wear a pair of trainers with a thin sole. As soon as you start getting more involved in karting, you will have to start providing your own protective outfits. This can be quite expensive, and it’s best not to buy clothes and helmets second-hand, as they won’t necessarily be as safe as brand new items once they’ve already been worn several times by someone else. There are many shops around the country that sell all the protective clothing you need, from protective overalls, to gloves and boots. When you first start karting, you aren’t expected to buy your own protective clothes. If you decide to join a karting club and take up karting on a regular basis, you will have to find your own outfits to compete in. As well as the necessary fire-resistant overalls, some drivers also like to buy waterproof ones to protect against the elements during races, but this is purely optional. As you can’t change clothes during a race, it does mean wearing them during every race just in case it happens to rain.